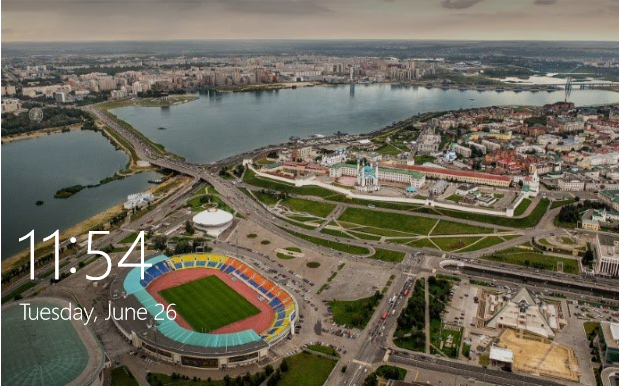 Which city can be seen on this Windows 10 lock screen photo featuring a stadium next to a river? This picture is currently my lock screen on my Windows 10 laptop, but nowhere can I find any captions which tell me which city this actually is. I also tried reverse Googling. No results. I asked my geography teacher; he doesn't know either. The city looks like it is in a dry area (river banks); also, the building next to that "castle" looks like a mosque to me. So maybe it's some Oriental city, but it also looks very modern. It's Kazan, Russia, which is where the FIFA World Cup is being played right now (in 2018). The stadium in the foreground is the Tsentralnyi Stadion, with the Kazan Kremlin just beyond. The river is the Kazanka River. What coast or river-adjacent city is in this photo? What is the location of photo used for Windows 10 lock screen?